Help us get behind some good causes!!! Here’s an opportunity to have a great night and get behind some worthwhile causes. 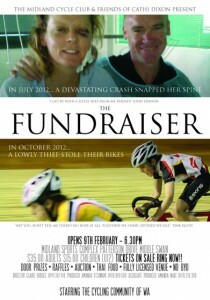 The Midland Cycling Club has organised a family friendly fundraiser to purchase kids track bikes (to replace those that they had stolen from the Velodrome) whilst also helping our cycling peer Cathi Dixon with her ongoing rehabilitation needs (needed for severe injuries she sustained in a cycling accident in France last year). Matt Poyner will be the MC for the evening and there is an extensive range of cycling and non-cycling related door prizes and items that will be auctioned on the night (e.g. signed pro-jerseys, travel / dining vouchers, cycling equipment just to name a few). How could you say no to a cooking and lycra free night with the cycling community??? See you there! Previous Postladies training assistanceNext PostGo Jonny Go Go!! Wembley Hotel the place to be! Bumma Alistair…money in the pot will be much appreciated :-).